Thank you for expressing an interest in my pre-school. You’ll be glad you did! I established the school in the fall of 1982. At that time, it was the first Montessori pre-school in Hunterdon County. Yes, you read it correctly, 30+ years ago! I had a dream and a passion to offer quality education to young children whose parents wanted the best for them, parents who understood the advantage of offering early academics and polite, positive, responsible socialization skills, parents who were discriminating enough to desire the best jumpstart for their child, and who embraced both academics and the true intrinsic value of play and imagination. 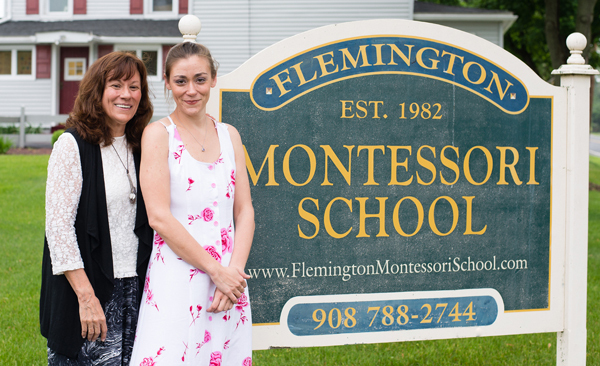 Effective the fall of 2014, the name and the website has changed to Flemington Montessori. My grown daughter, Jessica (who attended here and graduated from my kindergarten in 1990), is a wonderful Montessori teacher who has been co-teaching with me for a long time. Jessica and I will continue to provide quality education to children ages 3 (by October 1st) through 5 years. We offer a pre-school and a pre-kindergarten class. One difference between our pre-school and others, is that there are no more than 5 students per session in attendance at the school at any one time. Imagine the benefit to your child to be involved in such an intimate educational environment. We are both AMS Certified Montessori teachers, and together we have over 50 years of experience! Come meet us, and you’ll discover the difference a small private, family operated school setting can make for you and your child. The school is located in Flemington, New Jersey. We are near routes 202, 31, and 12, which provide easy access for parents.